After a tremendous summer of travel that took us to England and Colorado, we managed to squeeze in one final summer hurrah to St. Louis, Missouri. Since St. Louis is less than four hours from home, it’s a quick getaway, and we appreciate the full slate of attractions found here. For many RV travelers, deciding where to stay while in St. Louis is a conundrum. Staying right downtown puts you close to the action, but these urban campgrounds aren’t always the safest or most scenic. 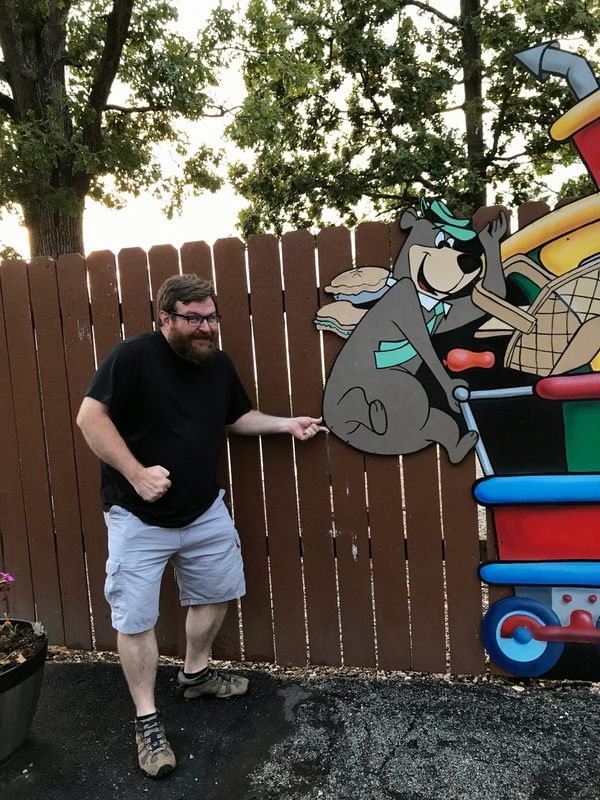 On two recent trips, we opted to stay out in Eureka, a town southwest of the city that is located off of I-44, one of the major highways that easily connects visitors to all of the attractions. 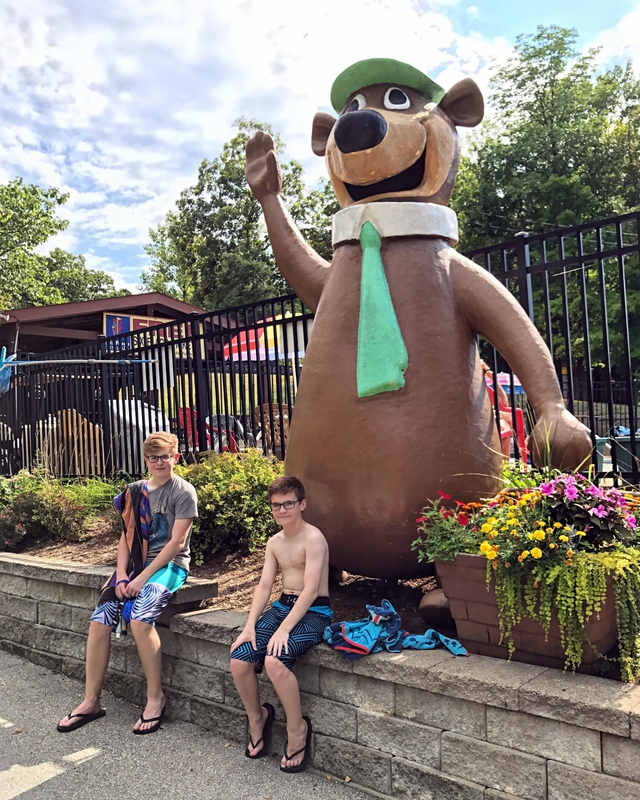 After an enjoyable stay at the St. Louis West KOA a couple of years ago, we decided to try out the Jellystone Park Resort Six Flags St. Louis, which is also known as the Eureka Jellystone. Yogi welcomed us to his park full of family fun. 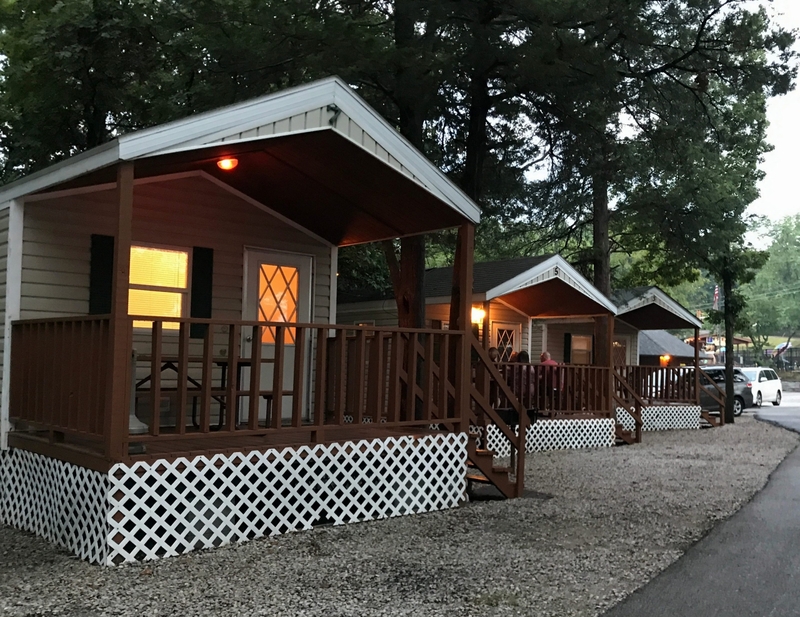 Tucked away in the forested outskirts of the city, this Jellystone offers campsites and cabins under a canopy of trees. Since we were visiting in early August when Missouri weather is hot and humid, we especially appreciated the shade. Campsites are divided into three main sections. Sites #2-24 are conveniently located and offer full hookups. These provide easy access to the pool, clubhouse, restrooms, and showers. The sites are not very large, so you will be stacked in close to your neighbor. Another problem with these prime sites is the tight roadway. Big rigs could easily have trouble getting backed in to their site (in fact, we watched a 5th wheel backing in and out, in and out, in and out). A handful of pull thru sites are available at the back of the park. If you have a longer rig, you will definitely want to talk to the front desk about the best site for your needs. These sites are easier to navigate in and out of, but they do put you downhill from the amenities. Up a hill from the main amenities, the park offers a large number of water/electric sites. These are less convenient to the showers and restrooms, but they seemed to be larger and quieter than the prime sites. This area was almost empty during our visit. If you want a little breathing room, this is the area for you, but remember, there is no sewer hookup, and the restrooms are a bit of a hike. To me, it seems like this Jellystone Resort is investing heavily in cabins. They offer more cabins here than I’ve seen at any other campground, with the majority being large, deluxe units. I wonder if they are using these to appeal to city dwellers from St. Louis who wish to get closer to nature, as well as families who are traveling to the Six Flags theme park. 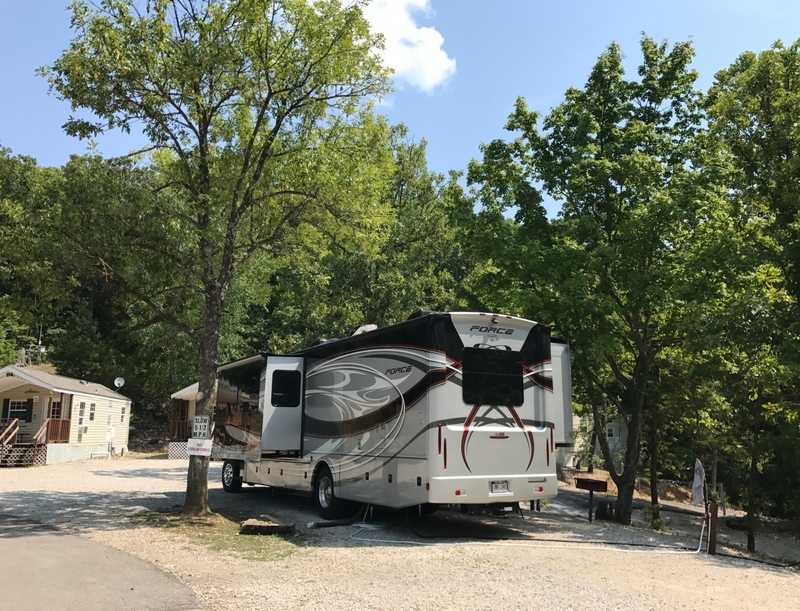 Whatever the reason, this option is there, which makes this park a perfect choice for RVers traveling with non-RVing friends and family members. Deluxe cabins rent for $170 a night during the prime season and sleep 6. Camper cabins (which do not include a restroom, kitchen, towels, or linens) are $90 per night. The cabins were chock full of families, making me think the park was making a good choice in investing in cabins, even at the cost of prime RV spots. I would say it is safe to bet that amenities and activities are the main draw for a Jellystone. The campsites may not be huge, but the full slate of options for entertaining the kids is incomparable at most campgrounds in the chain. The St. Louis Jellystone is no exception. Since we visited during a hot week in August, the pool was harkening to our family. We worked up a sweat setting up the campsite and were so glad to take a dip in the refreshing waters. 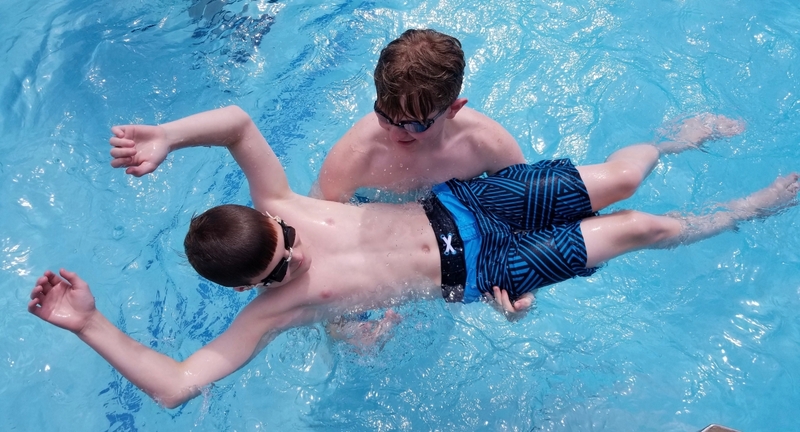 Though plenty of other families had the same brilliant idea, we never felt the pool was overcrowded since it is fairly large. Another fun amenity found here is the mini-golf course. 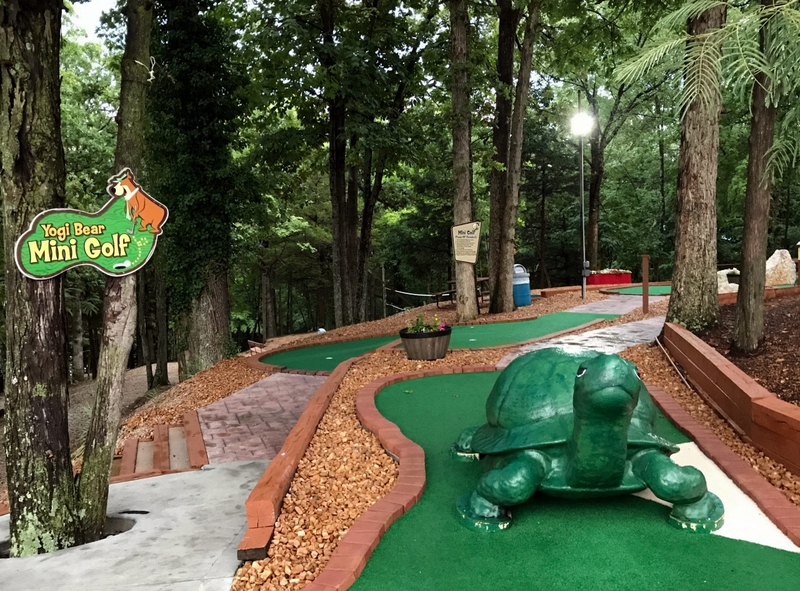 I’ve seen many neglected courses at other campgrounds in sad conditions, but the St. Louis Jellystone looks to have recently renovated theirs. At $4.00 per person, the price was relatively reasonable. Overhead lighting make this a nice option for after dark, as well. 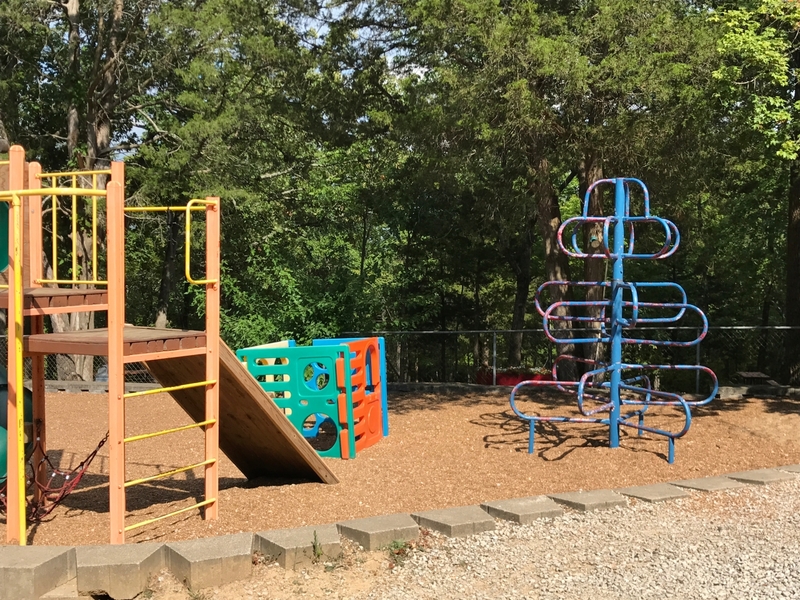 The playground includes several pieces of play equipment, appropriate for children of various ages. 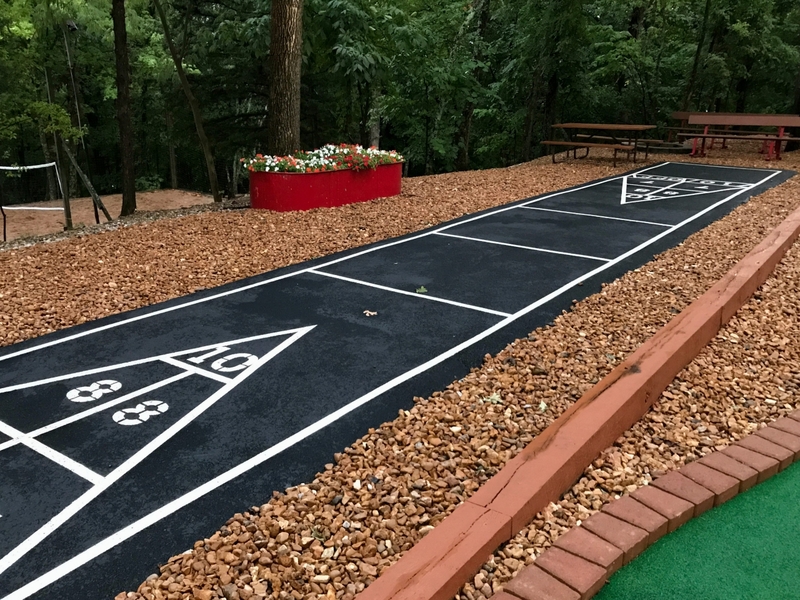 Nearby, a sand volleyball court and a shuffleboard looked like appealing spots for older kids. One final amenity of note is the golf carts. With some sites and cabins located up and down hills, a motorized vehicle makes it easier to buzz around. However, at a cost of $50 per day, they are not cheap. 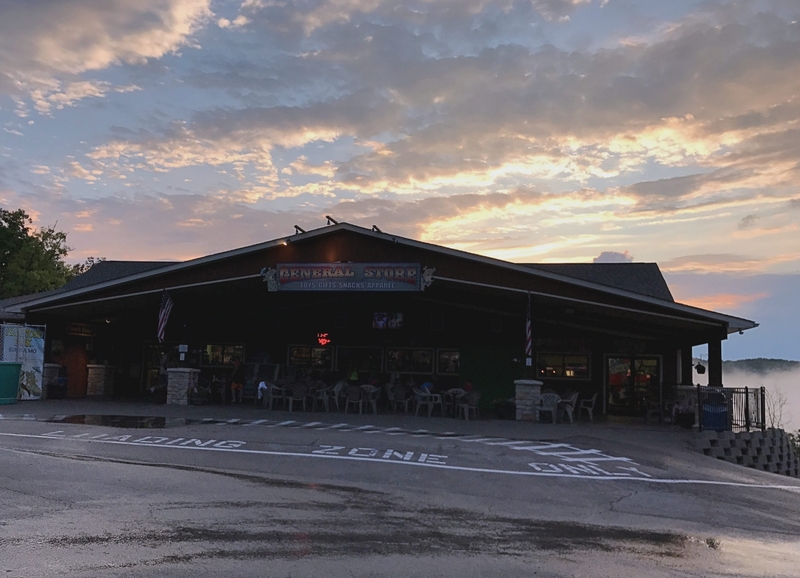 Finally, the camp store is the true hub of the campground, offering a HUGE array of items with kid appeal, a snack shack, a rec room, and more. The huge, covered front porch is a great gathering spot, providing a protected area for the many activities that take place here. 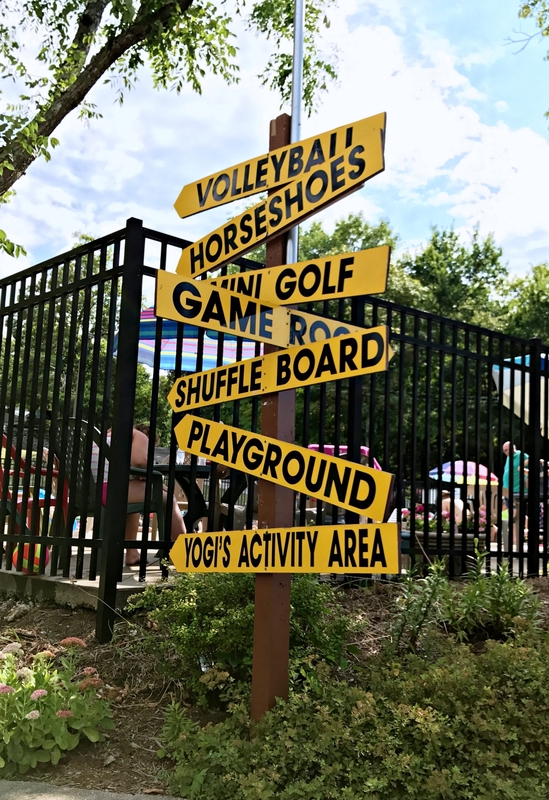 Even if you don’t participate in any of the scheduled activities, the amenities available will provide a lot of entertainment in the park. From morning to night, the St. Louis Jellystone offers a full slate of activities. Little ones will want to wake Yogi up in the morning, and they will be thrilled to see that he lives in a really cool cave at the campground. And, of course, photos with Yogi are a fun tradition. 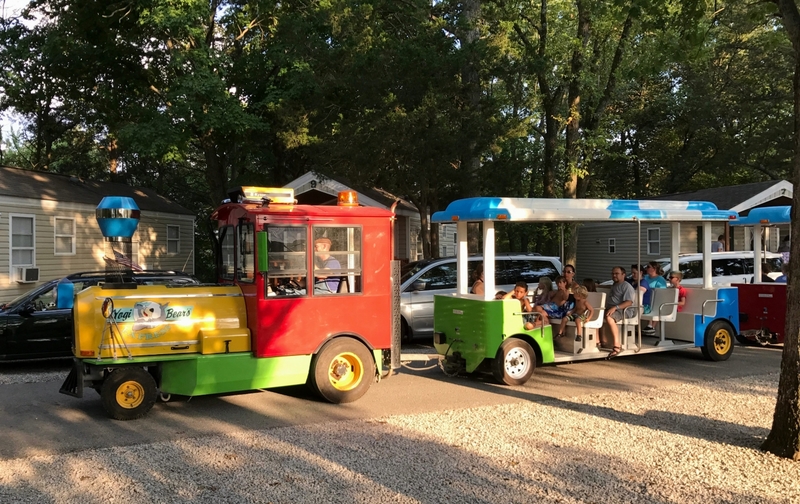 Twice a day, the Yogi Express chugs through the campground. For a small fee, you can hop aboard. (Instead of paying for items like the train and mini-golf, check to see whether it would be cheaper to purchase an activity wristband). Before your visit, be sure to check out the activities calendar online (or grab a schedule upon check in). Throughout the day, many options are offered–I counted up to 17 items on a single Saturday. I was pleased to see that quite a few were free to balance the activities that required a fee. 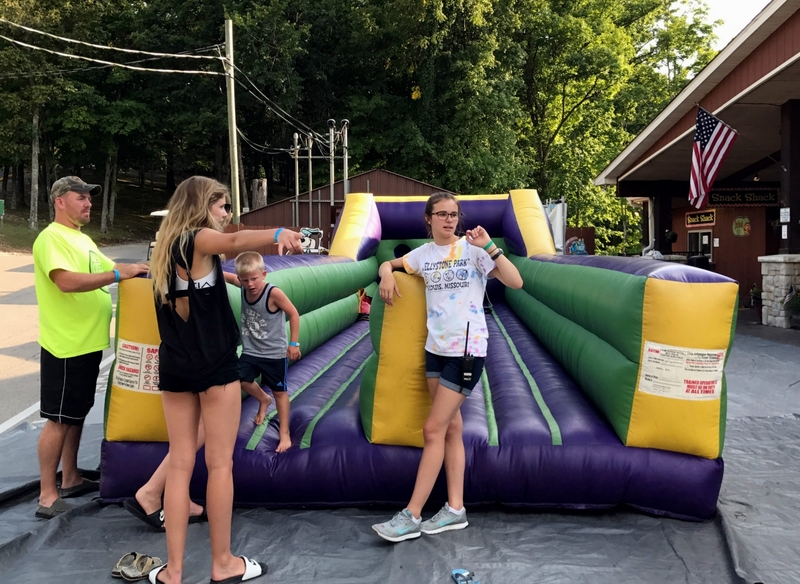 Water balloon fights, lollipop scavenger hunts, dance parties, a giant inflatable, and more were on the menu during our visit. 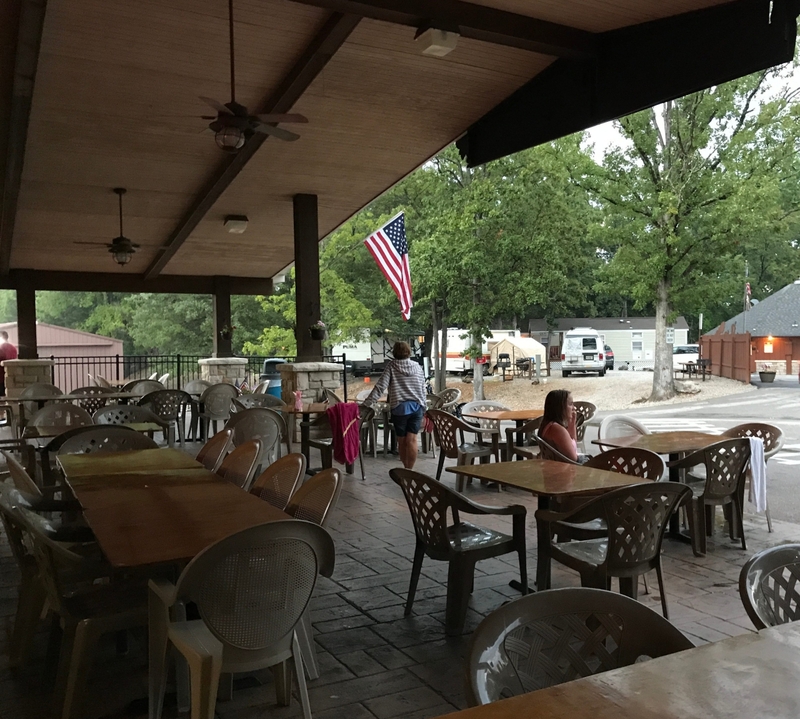 I was especially impressed when we noticed the workers setting up a giant movie screen under the covered patio during an unexpected rainstorm. Themed weeks add to the fun. Through the summer and early fall, each week has a designated theme that adds to the fun. Special contests and entertainment are offered. The Halloween Spooktacular weekends looked like something our boys would have loved when they were younger (do note that these wrap up early in October and do not extend close to the actual holiday). One final thought, our boys are aged 12 and 15, which made them a little older than the prime audience for many of the activities. However, I noticed several activities on the calendar that would appeal to tweens. The park seems intentional about planning for both younger and older kids. While this age group might not care to wake up Yogi Bear, who doesn’t love a black light dance party or a rousing game of Candy Bar Bingo? With these kinds of activities, you will have to pull the kids away from the campground–or, just sit back and relax while they have fun! 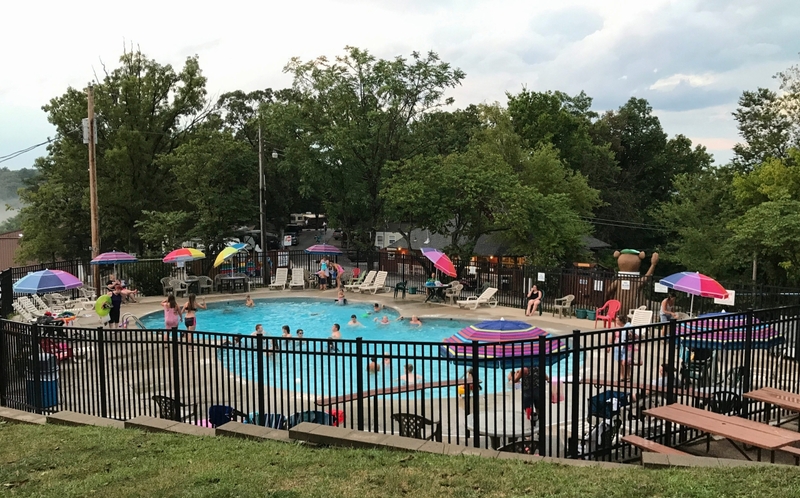 As the campground’s name suggests, the proximity to Six Flags of St. Louis is a major selling point. This park is half of a mile away from the theme park. 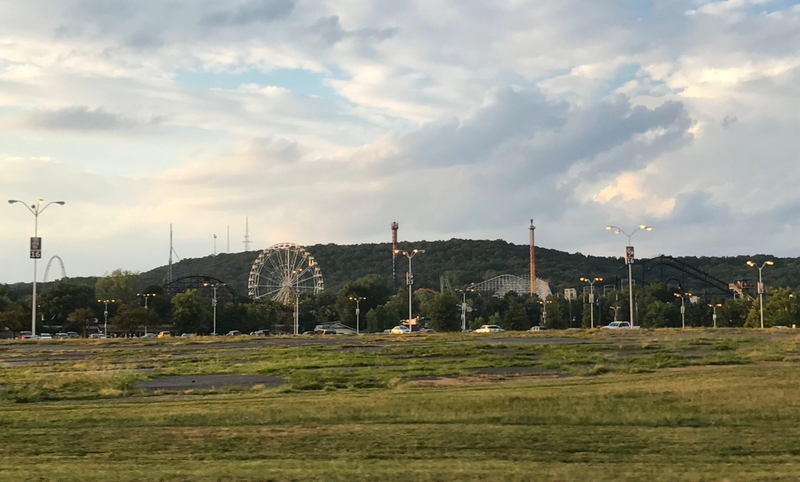 I haven’t been to the park since I was a teenager, but I’m sure it still holds the same appeal for kids, with plenty of thrill rides and traditional theme park attractions. A quick 15-minute drive takes you to the heart of the city, where you’ll find a wide array of attractions. The St. Louis City Museum is unlike virtually anything you’ll find elsewhere–put it at the top of your list, especially if you have older kids (including those hard-to-please teens). Check out my visitor’s guide to this family favorite HERE. From the Gateway Arch to the St. Louis Zoo, you’ll find plenty of entertainment options. I lived in the city until I was 9 and have made many, many trips back ever since, and I still haven’t come close to seeing it all! If you are planning a family trip to St. Louis, I highly recommend a stay at the Eureka/Six Flags Jellystone. If you are seeking quiet relaxation, this probably isn’t the park for you. However, if you want a campground offering plenty of activities for the kids and convenient access to the city while still being in a scenic environment, then this is an excellent choice. Rates: $52-63 per night depending on hookups. Additional $5 per night for each person over the first two. Activity bracelets are $8 per person and cover many of the paid activities for your whole visit. Cabins are $90-$170 per night. Bathhouse: The showers and restrooms were adequately clean. For such a busy place, I was pleasantly surprised. Amenities/Activities: Pool, mini golf, shuffleboard, sand volleyball, playground, and TONS of planned activities. The WiFi was functional at our website, as well. 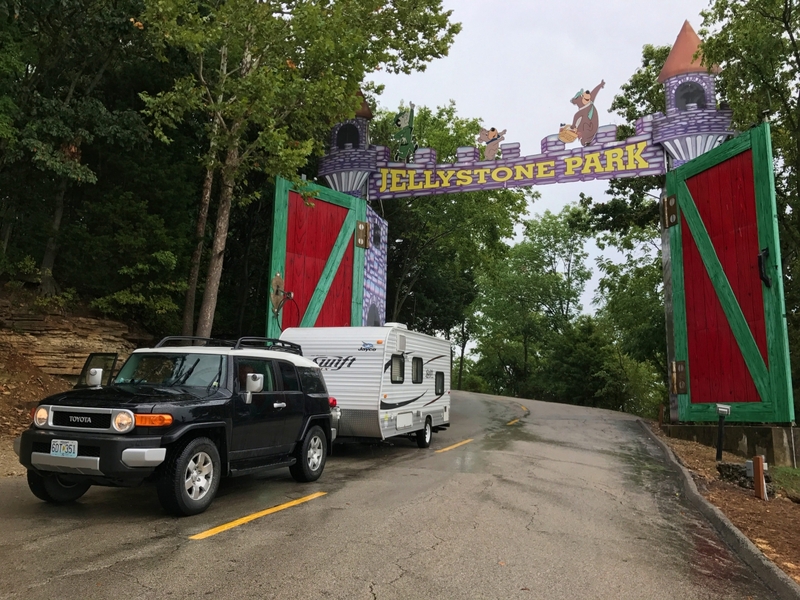 Bottom line: St. Louis Jellystone is a perfect basecamp for families visiting St. Louis. You won’t even need to leave the park to keep the kids happy. 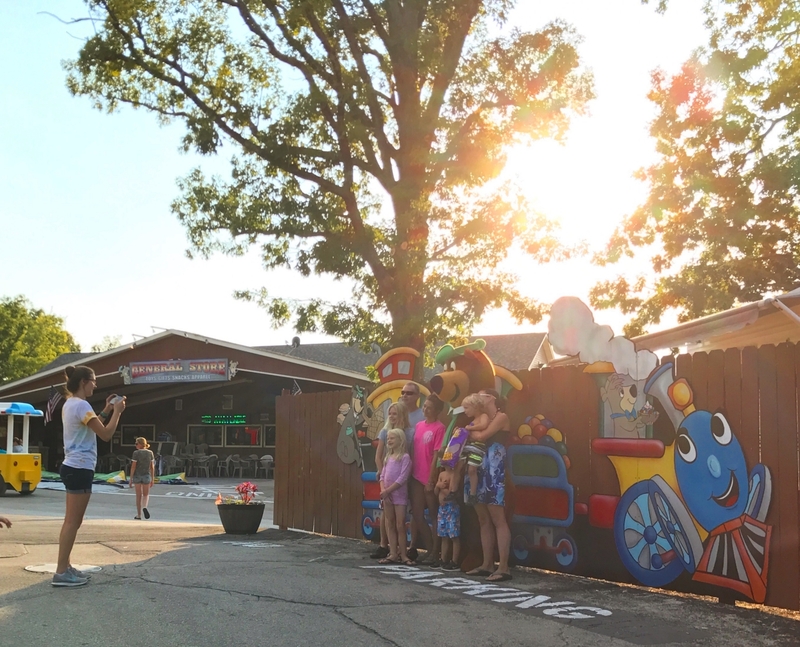 The St. Louis Jellystone was the perfect place for our family to have one last splash of summer! Posted in: Campground Reviews. 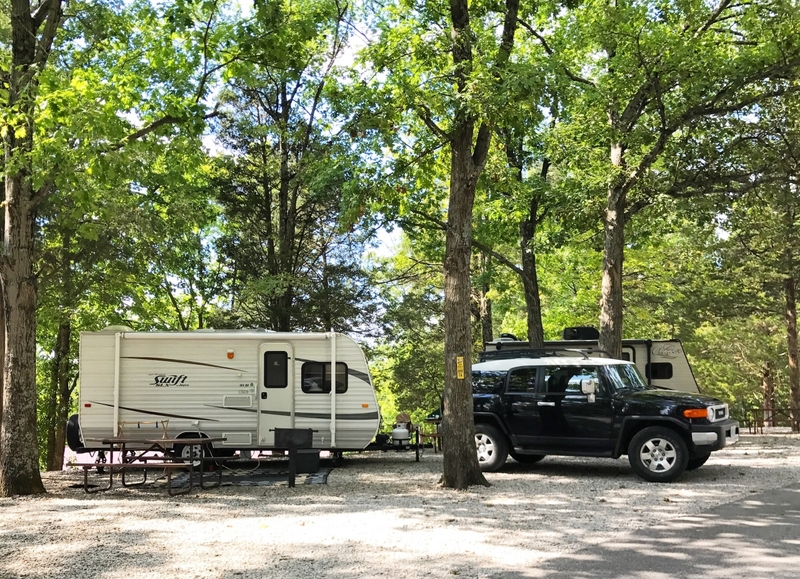 Tags: Campground review, Missouri, Private campground, St. Louis.